Located in Chartres, an old town in northern France known for its centuries old cathedral, the house of Raymond Isidore (1900-1964), surnamed Picassiette, is among the best known mosaic-decorated sites in the world. 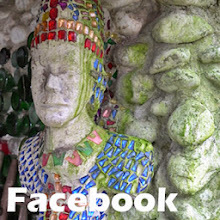 In France it ranks as one of the three top art environments (the other ones being facteur Cheval's Palais Idéal and the sculpted rocks by Abbe Fouré). Isidore mainly had simple jobs. As a young man, living with his parents, he worked as a moulder in foundries. In the early 1930's he was employed by a tramway company and around 1935 he became employed by the city of Chartres as a cantonnier in which capacity he worked as a sweeper at the local graveyard. In 1924 he married Adrienne Dousset (b. 1889) who by that time already had three children. In 1929 he bought a plot of land along what currently is the Rue de Répos and in 1930 he began building a house where he would live with his wife and the children. The story of the decorations begins in 1938, when Isidore made a walk in the neighbourhood and happened to see some pieces of broken pottery which drew his attention and inspired him to make mosaics from broken kitchen ware. 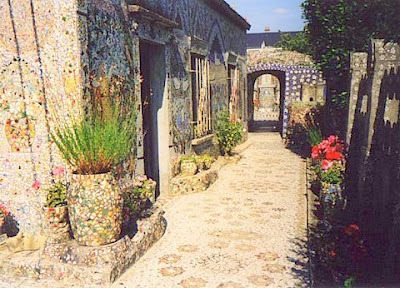 The next twenty years or so, Raymond Isidore would never stop decorating his house with mosaics, finding his inspirations in dreams he had at night. Raymond Isidore died September 7, 1964, on the eve of his 64th birthday. His wife Adrienne continued to live in the house until she passed away in 1979. They are buried in a family grave in the local Saint-Chéron graveyard. In the 1950's in France interest in sites like the one made by Isidore began to grow, mainly in circles of the avant garde. Picasso paid a visit to the site in 1954 and the photographer Robert Doisneau (1912-1994), who in the 1950's became a famous photographer of the Parisian art scene and the city's street life, in 1956 made pictures of the site. The photographer Gilles Ehrman also visited Isidore and his 1962 photo-book Les inspirés et leurs demeures might mark the beginning of recognition of sites like the one by Isidore in official french circles (in 1969 the french minister of culture Malraux would classify facteur Cheval's Palais Idéal as a historical monument). After Isidore's wife died, the house in 1981 was sold to the city of Chartres. In 1983 it became a Monument Historique and currently it is part of the Chartres Museum of Fine Arts. In this post I will not describe this art environment in full detail, because the internet already has a very good "guided tour" on the website The Joy of Shards. Isidore got his nickname Picassiete by shortening Picasso de l'assiette, a nickname that probably was first used by a journalist who wrote about him in a local journal. The french word assiette means plate. In the world of mosaic-lovers and -makers pique assiette currently is a generic name for mosaic products made with found material. in 2019 open for the public from 15/3-15/11.
! closed on Tuesdays !